It was a fabulous time of fans, friends, and race enthusiasts, especially those who love racing’s history as shown by the restored and tribute Indycars of the past. 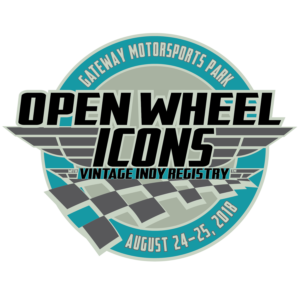 To show my personal gratitude to the drivers, crew members and individuals who made the inaugural Vintage Indy Registry Open Wheel Icons event such a success, I offering a limited time discount, through the end of this month (September 30, 2018). 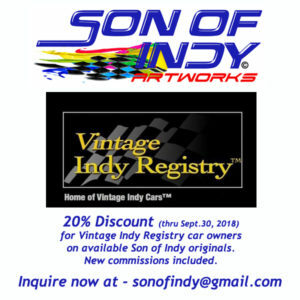 This offer is for any Indycar / open wheel racing fan who enjoys motorsports history. The 20% discount applies to available originals and commissions. Commissions require a 50% deposit, due upon agreement of subject and composition. Balance due upon completion. Shipping of artwork is separate and not included. Email via link embedded in picture below or here.